An unexpected trip to Burbank was planned to co-incide with lunch, so we could pick up some Popeye’s Fried Chicken. Half the Large Red Beans and Rice is $2.15 with tax, per serve. Lunch today cost $4.85 per serve. The meatloaf meal from last night was a double batch, so we repeated the meal tonight, but fried off the meatloaf which gave it a really nice maillard reaction on the surfaces. Served with the remaining chipotle mashed sweet potato and fresh steamed bok choy. The bok choy was $1.99 for the pack, and we used half, or 50c per serve. Tonight’s dinner was both tasty and nutritious for $5.09 per serve. With little in the house, we needed a restock trip to Trader Joes, which lead to the quiche lorraine. The quiche is $5.49 or $2.75 per serve. Among the remains of our Prather Ranch meat deliveries after skipping a month was a pound of ground pork. Add a pound of ground beef and it’s meatloaf time. Served with chipotle mashed sweet potato and steamed bok choy for some green. The recipe makes four generous serves. We shared some small bites at a cafe/bar in the Encore hotel – steak tartar, duck rolls, crab cakes – which was paid for by a business associate. We then started the journey from Las Vegas home, stopping at the Mad Greek Cafe in Baker for a late lunch, that ended up doubling as dinner. With tax and tip, the roast lamb yeros was $14.42 per serve. While working in the LumaForge workflow suite, one person went out and bought us yeros wraps for $10.00 per serve. A party in the workflow suite saw us eating some very ordinary pizza in a great environment. Pizza was sponsored. The Foodies skipped lunch because of their schedule after skipping lunch. Early in the evening, we grazed briefly on an event’s buffet, and then headed to the famous Peppermill Diner for a late dinner. Foodie Philip had Eggs Benedict while Greg had a Reuben. Dinner tonight cost approximately $22.50 per serve. The NAB schedule makes it more practical to have a big breakfast and skip lunch, which is what we did by sampling the Wynn buffet. We find it hard to get good value from a buffet as we don’t eat huge amounts of food, but what we ate was good. Breakfast was $44.60 per serve with tax and tip. The evening was spent at a sponsored event. It could be considered our most expensive meal, as our two companies were two of the seven sponsors of the event at the Hard Rock Cafe! On the road to Las Vegas and the NAB show, we stopped at Zzyzx and had a wild caught smoked salmon, with labné, tomato, capers and thinly sliced red onion on a toasted onion bagel. Lunch today cost $4.46 a serve. Before heading for our traditional Sunday night steakhouse dinner with a friend, we were fortunate to experience the food of two MasterChef Junior contestants: Robbie Coblentz and Adam Wadhwani. Naturally the finger food was delicious. We then dined at New York, New York’s Gallagher Steakhouse where our friend treated us to an amazing meal. Foodie Greg picked up a Chicken Caesar Salad kit at Trader Joes, which we augmented with the remaining supermarket chicken breast. Remaining half chicken breast is 63c per serve. Lunch today cost $2.63 per serve. We’re heading off for the NAB trade show so we in ‘using up’ mode. We finished the refried beans, flatbread and eggs we had on hand and made our version of a quesadilla. Two eggs (average) each adds $1.00 per serve. Dinner tonight was elevated by fresh-from-the-hen eggs via a friend and cost $3.41 per serve. A few errands found us in the general vicinity of The Country Deli, so we stopped in for lunch. Lunch – good as always and with a take home snack for later – cost $21.50 per serve, on average. 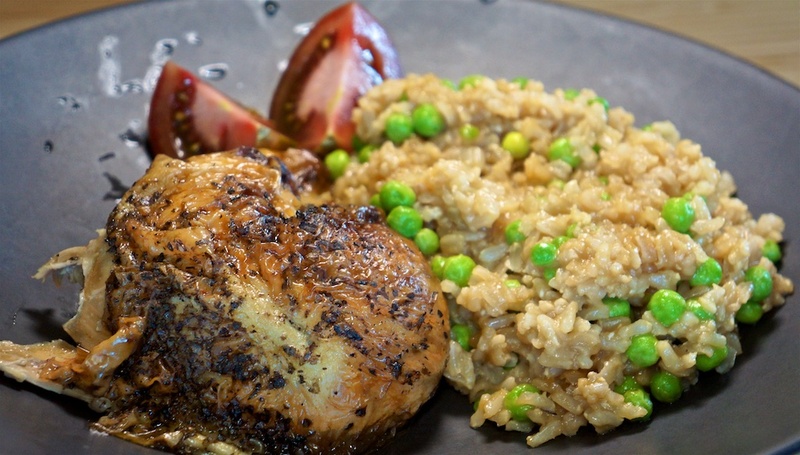 Tonight we had the legs from our supermarket chicken with a brown rice pilaf. A simple, easy to prepare meal. We shared one kumato or 29c our serve. Dinner tonight cost $4.04 per serve. We have chicken, we have wraps, but we don’t have any salad! Hummus is $3.99 per container and we used about 1/6 or 92c per serve. Lunch today cost $2.08 per serve. Two thick cut, bone in pork chops remain from our Prather Ranch meat delivery, so why not prepare them and serve with a Waldorf salad. The pork chops were sous vide and then quickly fried off in some butter to give them a good finish. Celery and dressing adds 15c per serve. Tonight’s dinner was excellent. The pork chops were perfectly prepared and the salad a tasty side for $11.33 per serve.